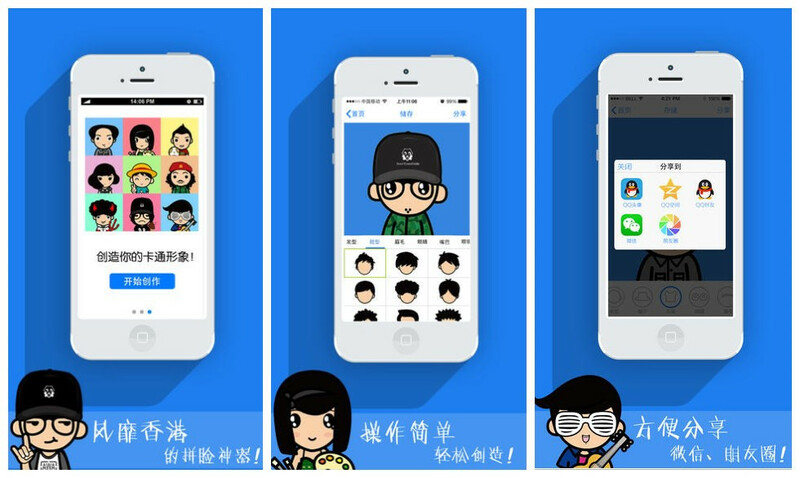 If you are a fan of photo-editing apps like MomentCam or Siyanhui, you probably will love MYOTee, a cartoon image collage app that has gone viral in China around the past Dragon Boat Festival holiday (May 31-June 2). To get started, the users only have to tell the app whether you’re trying to create a male or female cartoon. Then, the users can select from a wide variety of built-in templates for different parts of the face. More templates for detailed categories are added, including glasses, cloths, hats, habits, backgrounds and talking bubbles. Although this kind of cartoon image editor is nothing new to us, given previous killer apps, like MomentCam, Bitstrips and iMadeFace, a major differentiator of MYOTee is its cute cartoon style. According to the company, the drawings of MYOTee are designed by a Hong Kong designer in 2007. He has built a popular website to sell T-shirts printed with these cute avatars of pop stars. The completed images can be downloaded to the camera roll on devices, or shared directly from the app to social networks, such as Sina Weibo, WeChat, etc. Launched at the end of last year, MYOTee now claimed more than 2 million registered users. The app is currently sitting at the top of the App Store free app chart in China. According to latest data, MYOTee recorded more than 1 million downloads between May 30 to June 2. MYOTee is founded by Guo Lie, a former employee at Tencent, together with a group of post-90s youths. The company has received millions of yuan of funding from IDG and is seeking for a second round of financing.